Lady Slipper Orchids are among the few terrestrial orchids commonly grown indoors. 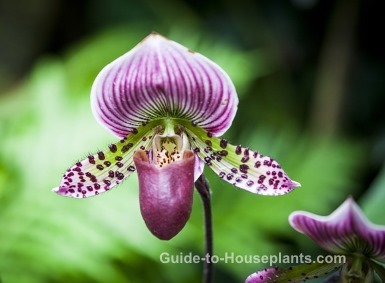 There are 60 species of Paphiopedilum orchids in the wild -- growing in climates ranging from the cool, high Himalayas to the hot, rocky terrain near the South China Sea. Its unusual blossoms have a slipper-shaped pouch that is often in a contrasting color to the rest of the flower. It has long, flaring side petals and a showy dorsal sepal (that's the top part of the bloom). Bloom time varies with the species. Flowers last for several weeks and range in color from soft pastels to any exotic combination of rich, earthy tones. It has strap-like leathery leaves that are solid dark green or attractively mottled. Oddly, leaf color will tell you their temperature preferences. 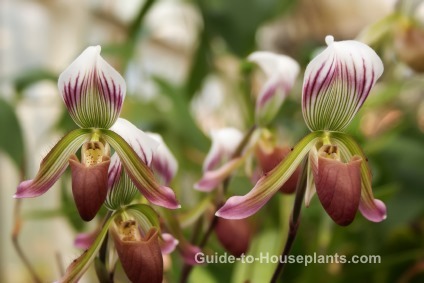 Paphiopedilum orchids with solid-green leaves like cool temperatures and those with mottled leaves need more warmth. Dry air can be deadly to orchids. A wet pebble tray, room humidifier or regular misting will help to maintain at least 50% humidity that will keep your orchids happy. Paphs seem to grow better when surrounded by other paphs -- or even other types of plants. Coming together as a group raises the humidity around these moisture-loving orchids. Or perhaps they just like the distinguished company. Plant in a loose medium, such as an orchid mix that allows plenty of air around the roots. This type of medium decomposes over time, becoming compact and slowing drainage, so it's a good idea to repot your orchids every couple years. Don't over-pot. Use a pot that's 1-2 inches wider to allow 2-years' growth because orchids do best when slightly crowded. Repotting how-tos: To repot, gently shake off the old medium and dip the roots in a bucket of tepid water to get rid of the clinging stuff. Spread the roots over fresh mix in the bottom of the pot. Once positioned, fill the rest of the pot with mix so that the plant is stable, making sure that the junction of roots and stem are slightly below the surface. Don't be afraid to plant the roots a little deep -- they tend to climb out of the pot. You can top-dress it, if you need to. Light: Moderate to bright light, no direct sun. Paphs need bright, indirect sunlight to bloom. Lady slipper orchids also do well under fluorescent lights. Water: Keep mix evenly moist at all times. Paphs prefer more moisture than epiphytic orchids. And if you keep your orchid under grow lights, it'll need watering more often. Just don't overdo it. Too-frequent watering can cause root rot. Humidity: Requires moist air -- preferably 50-60% relative humidity. Set pot on a tray of wet pebbles and mist leaves daily with room-temperature water. Or use a room humidifier. Temperature: 60-65°F/16-18°C nights and 75-80°F/24-27°C days. To ensure blooming, give your orchid slightly cooler nighttime temperatures. A 15° difference will do. Soil: Orchid potting mix or 2 parts fine-grade fir bark: 1 part perlite or sand: 1 part sphagnum moss. Fertilizer: Feed with an organic orchid fertilizer, or fish emulsion, or a balanced house plant fertilizer diluted by half, twice a month during the growing season. Propagation: Division. Pull or cut the fans of the leaves apart into clumps of at least 2-3 growths.